If you look in the butcher’s fridge in your local supermarket, you’ll notice that massive big slabs of sinister-looking, meaty meat are being sold for peanuts. If you look at the label, you’ll notice that this stuff is usually pork. I don’t know why pork is cheap and lamb expensive, but that’s the way it is and it seems a good reason to eat lots of pork. (This price discrepancy probably makes you feel rather special if you are the four-legged mother of a lamb). But how? 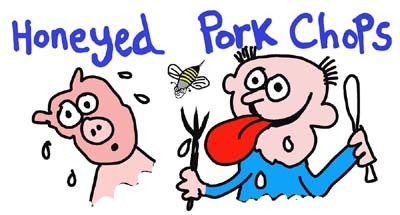 If you just fry or grill pork, it tastes dull and a bit dry. So the answer is to smother it in something tasty that’ll take away the porky taste. Which is exactly what you do in this recipe. 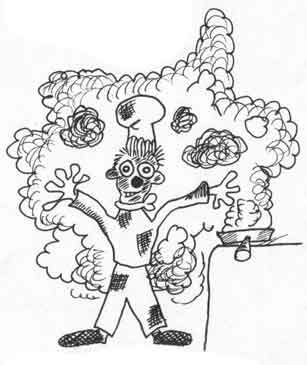 Firstly, put on your grill and leave it to get red hot, which will take a few minutes if it is electric. While the grill is heating, sprinkle some pepper onto both sides of each pork chop. Press this pepper into the meat with your fingers and, because the pork is slightly damp - (in a dead pig sort of way) - the pepper will stick. Next put the pork chops onto the rack of a grill pan and dollop a dessert spoon of honey onto the top of each pork chop. If you dip the spoon into a cup of boiling water before you do the dolloping, you’ll find that the spoon stays hot and the honey won’t stick to it - it’ll just slither off. Now put the grill pan under the grill. You need to position it so that the top of the pork chops are about 10cms away from the heat. Too close and the honey will burn, too far away and it doesn’t cook properly. Put a dessert spoonful of oil in a frying pan or, better still, a wok. Put the frying pan or wok onto a high heat. 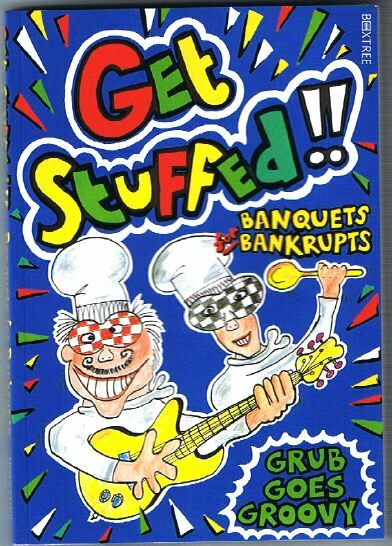 Bung in the chopped vegetables. Keep stirring the veggies around so that the ones on the bottom don’t burn. It’ll take about six minutes for the veggies to cook. When they are ready, they will look cooked. Meanwhile, the honeyed pork chops will probably be ready by now. To serve, put them on the hot plates that you had wisely pre-heated in the oven. Next pour on top some of the molten honey from the grill pan. Finally, shovel on as much COURGONIROOM as the plate has room for. There are a couple of important riders to this dish. 1. If you cook this dish, make sure that some other poor sod does the washing up coz getting the burnt honey off the bottom of the grill pan is a miserable job. 2. Make sure that you don’t cross-contaminate your pot of runny honey with raw pork. I don’t know what’ll happen if someone makes themselves a honey sarnie with pork-contaminated honey and, quite frankly, I don’t even want to know because it’s probably too horrible to contemplate. I expect that they turn green, and their legs turn into rhubarb and they grow silly steampunk beards. Just don’t go there - you’ve been warned! 3. Thoroughly wash your handies, chopping board, and everything else that comes into contact with raw meat. Better still, use kitchen disinfectant spray. The pork chops will take about 15 minutes to cook and, during this time, the honey will drip off and dribble into the grill pan. Each time that the chops are looking honeyless, turn them over and put on another dollop of honey. During the time that the chops take to cook, you will probably turn the chops about four times. While the chops are cooking, it’s a good idea to put some plates into the oven to warm up. Food keeps warmer for longer if it is served on hot plates but make sure that they aren’t too hot or you’ll burn the silky skin on your lily-white handies. 4. cooking some tasty veggies. 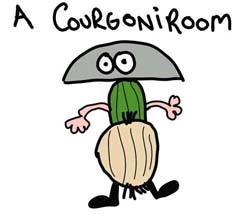 Something easy would be the traditional delicacy: “COURGONIROOM” (pronounced, “cor-go-knee-room”) - a dish whose renown has eluded both Mrs. Beeton and Escoffier’s famous oeuvres. Chop all the veggies into small bits, being sure to remove the onion’s outer skin.